The gold teeth really stood out. They were the only things in view which shone. Everything else was dull, dirty, torn, charred – including the skull in which the teeth remained firmly fixed. The fire in which this person had died, or which had burnt their abandoned corpse – it was impossible to tell which – had been sufficiently hot to burn flesh, but not to melt gold. 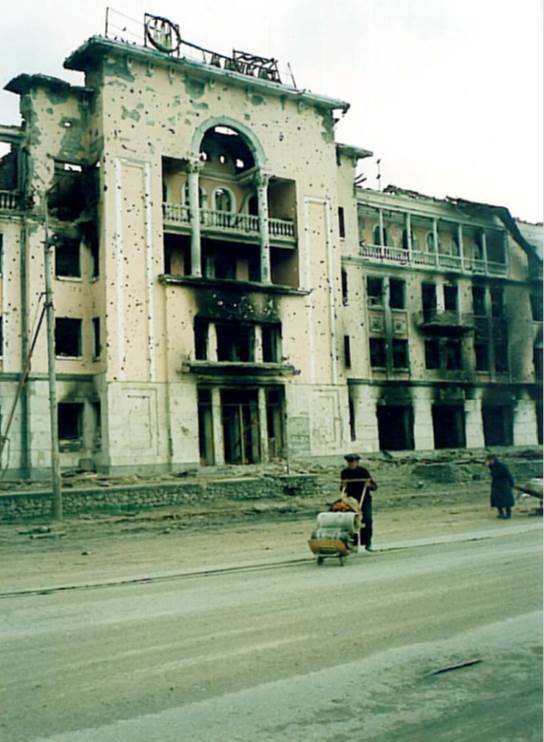 It was Chechnya in the spring of 1995. A group of BBC News colleagues and I were in a burial ground outside Grozny, Chechnya’s main city. Since the previous December, the Russian Army and Air Force had been engaged in a major operation to bring the increasingly lawless region back under the control of the Federal Government. Countless civilians had been killed as they did so – some blown to pieces. I know that because whoever was supposed to be burying them had half-heartedly tried to put them back together in death. One set of remains I remember was a skull, and a leg bone with a training shoe still on the foot. Among the dead, there may have been combatants. It was impossible to tell. It was possible, though, to see that many almost certainly were not: the scorched remains of printed dresses, as loved by grannies in the Soviet Union, were still visible on some of the burnt bodies. Before writing this, I took out some photos I have from that day. I prefer not to share them here. They are gruesome, and still shock me almost two decades later. I looked at them because of some work I am doing at the moment on how International Humanitarian Law (IHL) relates to journalism. It is a work in progress, and I am a consultant not the author, so I am not able to share details at the moment. I will do so here eventually, though, because it is important. In fifteen years at the BBC, and five at Reuters TV before that, I was fortunate enough to get a lot of first-rate training from experts in many different aspects of news and journalism. In two decades, though, I only remember one seminar about IHL – the body of law which covers armed conflict. Journalists reporting conflict have to learn many things – often finding themselves obliged to learn large chunks of history at short notice as they fly into an area where that history has come back to haunt the present. (If any of my History of Journalism students at City University London are reading this, let them take note!). So IHL is not something which is often studied in detail. There are good journalistic reasons for knowing something of it. Journalists in conflict zones have both rights and responsibilities under IHL, and knowing what those are can offer an extra edge to reporting. How much more impact your coverage can have if you can accuse an army of war crimes, and know the law which is the basis of the accusation. Many such crimes go unpunished. I am certain no one ever faced a court for the deaths of the people whose burnt corpses I saw that day. Sometimes, though, the fact that they are reported may mean that war criminals will one day face justice. The reporter who knows a war crime when they see one can contribute even more effectively to that draft.